KIEV, Ukraine -- A Ukrainian court on Friday upheld the conviction and seven-year jail sentence for former Prime Minister Yulia Tymoshenko. A supporter of former Ukrainian Prime Minister Yulia Tymoshenko holds a posters outside the Appellate Court in Kiev, Ukraine, Tuesday, Dec. 20, 2011. The Kiev Court of Appeal continues consideration on the case of Tymoshenko who in October was sentenced to seven years in prison for abuse of authority during signing gas contracts with Russia. Tymoshenko, the top opposition leader, was found guilty of abuse of office in October and sentenced to prison for overstepping her authority while negotiating a natural gas contract with Russia in 2009. The United States and the European Union have sharply criticized Tymoshenko's jailing and demanded her release. The EU this week refused to sign a key partnership deal with Kiev over Tymoshenko's verdict. The Kiev Appeals Court upheld the lower court's ruling. Tymoshenko and her lawyers boycotted the hearing and said the courts are controlled by the government. Tymoshenko, 50, has maintained that the prosecution was masterminded by President Viktor Yanukovych, her long time foe, in order to bar her from next year's parliamentary elections. Yanukovych has rejected the accusation and said the courts and law enforcement agencies are independent. Moreover, Tymoshenko was slapped with a slew of new criminal charges and investigations in recent weeks. A court ordered her indefinite arrest as part of a new case. Tymoshenko said Thursday she would boycott all legal proceedings in Ukraine and has lodged an appeal with the European Court of Human Rights. However, that process could take months and it is unclear if a decision by the Strasbourg-based court would be legally binding in Ukraine. 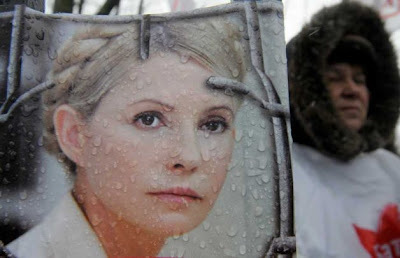 Tymoshenko's office says that if the Strasbourg court were to rule that Tymoshenko's right to a fair trial was violated, she would have to be released from jail. But some independent legal experts have said that while Ukraine's Supreme Court would be required to review the case, it won't necessarily be obliged to overrule the decision of the local courts.